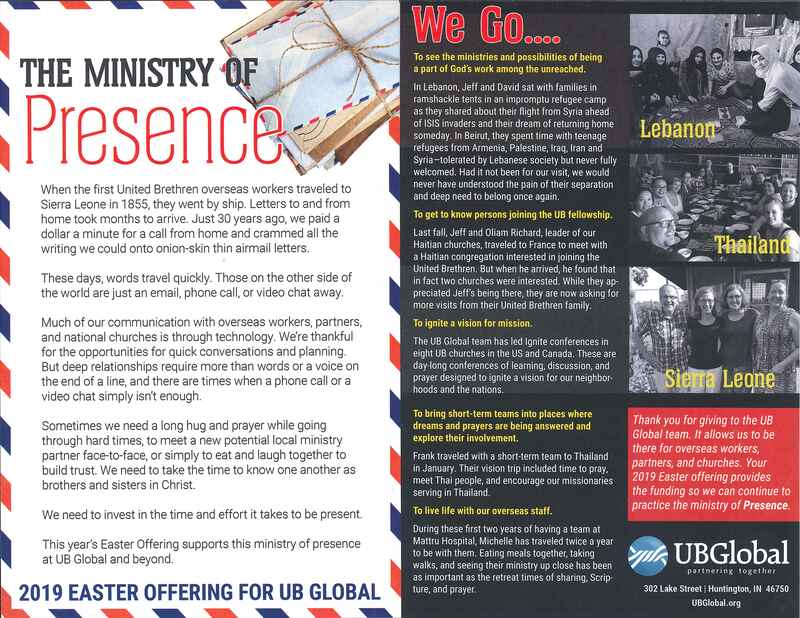 Your 2019 Easter offering will provide the funding for UB Global, so they can continue to practice the ministry of Presence. It will allow them to be there for overseas workers, partners, and churches. Please read through the UB Global flyer for this important pursuit. Also, a portion of your gifts will assist individuals from CP in 2019 have the opportunity to serve overseas on short term trips through some scholarship help with their costs. Mission Offering Envelopes are available in the Sunday, April 14 bulletin and at the Welcome Center. Please make your check payable to College Park Church. You may also include your donation with your regular offering check or envelope by clearly designating Easter offering and the amount you wish to donate. We will be collecting donations through the end of April. Thank you!